Is Poland the EU's 'new Britain' (or the 'new Ireland')? Nicolas Sarkozy is pursuing an ambitious agenda at today's EU summit as Mark Mardell blogs. At the heart of this summit though is the proposed deal on climate change. Leading the 'awkward squad' is Poland. Poland's Donald Tusk wants a combination of more time or/ and money to help Poland convert from coal. A reporter on the BBC's Today programme, Jonny Diamond, asked if Poland was the EU's new Britain - the nation always holding out against EU policies? It's certainly true that this is not the first time that this relatively recent EU entrant has threatened to block a Union-wide deal. Poland also had eleventh hour objections to the Lisbon Treaty. But Poland may be more like Ireland than Britain. Less notable for being the odd one out and more notable for its success at winning a large share of EU subsidies. Already due to receive £57bn over the next seven years for infrastructure improvements, Reuters is reporting that a new €40 to €50 billion "solidarity fund" (where solidarity = subsidy) might be Tusk's price for agreeing to Sarkozy's 20/20/20 pact. > Roger Helmer MEP predicts a costly deal from the UN summit in Poznan: "Cutting through the jargon, the probable deal seems to be this. The Eastern accession countries of the EU will blackmail France, and Germany, and Britain, into transferring vast sums in exchange for their agreement. Then the developing countries will blackmail the developed countries of the West into transferring even vaster sums to secure their agreement. For us, it’s a double whammy — the huge damage that any “Son of Kyoto” would do in its own right, plus the costs of bribing other countries to join in (or at least to save our faces by pretending to join in)." 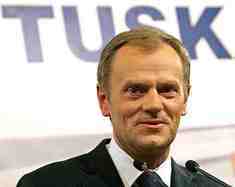 > FT writers profile the variety of challenges facing Donald Tusk and his Civic Platform party. French President Nicolas Sarkozy - currently President of the EU - failed to win agreement from Central and Eastern European nations for support for EU-wide action on climate change although certain concessions have brought the possibility of agreement closer. "The EU," reports AFP, "has set a triple "20" objective for 2020: slashing greenhouse gas emissions by 20% compared to 1990, increasing renewable energy's share of the market to 20%, and improving energy efficiency by 20%." Most opposition to the pact is coming from Poland and Italy. Poland is 94% dependent on coal-fired energy and is now confident of extended exemptions from the EU pact. "We think the package is a mistake. As it stands, it penalises our industry, increases costs for citizens, threatens jobs and makes Italy poorer." Disagreement within Europe coincides with growing restlessness in other parts of the world. "There is no chance whatsoever that any developing country will agree to that proposal," Marthinus Van Schalkwyk, South Africa's environment minister, said in an interview in London. "None of the developing countries -- all of us have said that up front -- are willing to commit to specific targets." The Sydney Morning Herald also reports that Kevin Rudd's government, once a leading enthusiast for action on climate change, is "back-pedalling". The frontbenches of Britain's political parties support the EU climate pact but a number of Conservative Party backbenchers are increasingly vociferous in raising their concerns. In recent days Italy and Poland had both signalled unhappiness that the EU was pressing ahead with ambitious climate change targets at a time of grave economic difficulty. French President Nicolas Sarkozy warned against retreat, however, and EU president, José Manuel Barroso came to his support: "We're not going to let up in the battle against climate change and there's no question of picking between the financial crisis and climate change. The two go together." The Guardian reports that "Eastern European countries, ex-communist states, want the richer nations in western Europe to carry more of the cost of cutting emissions and protection for their industries which are heavily dependent on fossil fuels, notably coal. Bulgaria, Hungary, Latvia, Lithuania, Poland, Romania and Slovakia wanted at one point to scrap the December deadline." "Conservative Members agree that the choice between ambitious and progressive action on carbon reduction and a successful, powerful economy is, in fact, not a choice at all—they are one and the same. Without decisive action, there is a risk that climate change will leach away huge resources from this country and every other nation on earth. The economic events of recent days have proved that catastrophic risk must be acted on rather than wished away." "There is a lot of ministerial hot air about these targets; new ones are announced long before it is apparent whether existing ones are realistic or achievable. In 1997, the Government said it was going to "reduce emissions of carbon dioxide by 20 per cent on 1990 levels by 2010". By 2003 this had become an aspiration to "move towards a 20 per cent reduction…" By 2005, it was saying that "emissions of all greenhouse gases would be around 20 per cent below 1990 levels by 2010". In 2006 a target was set for "all new homes to be zero carbon within a decade" but in the first month of 2008, just three zero carbon homes were built. The Government then pledged to reduce carbon dioxide by 60 per cent from 1990 levels by 2050, which Mr Miliband has now said should rise to 80 per cent in line with a recommendation delivered just last week by the Government-appointed Climate Change Committee. When the 60 per cent target was first recommended by the Royal Commission on Environmental Pollution, it implicitly included emissions from aviation. But Mr Miliband now says aviation and shipping will be excluded, though specific proposals for achieving this tougher target have still to be published."